Drawing can open up an extra channel of communication for non-verbal and less verbal people with autism. It can also be an effective teaching tool to support the development of conventional verbal and written language. Today's post will give you a quick tutorial on one teaching technique that I have developed for using drawing to teach the meaning concepts of words, sentences and paragraphs (a word's meaning is modified by the grammatical structure of a sentence, and the concept of a "paragraph" is a group of sentences that all involve the same topic and could be included in the same picture). For convenience sake, let's call it "Draw Together Paragraphs". Start with a big piece of paper. Draw a line across (about a quarter to a third of the way up from the bottom) - written text will go below the line and the drawing/illustration will go above the line. 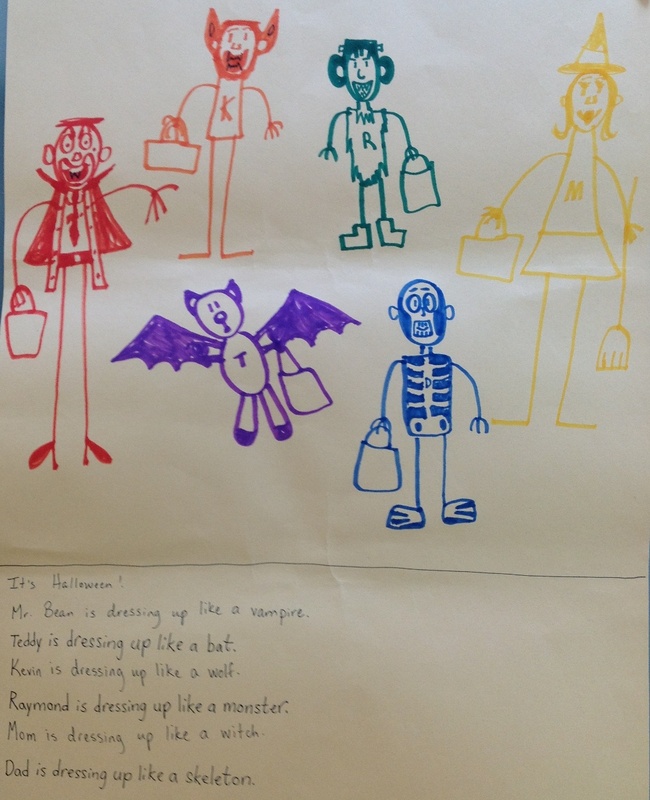 I usually start with a topic sentence (in this example "It's Halloween"), then I write the first sentence and my student will draw a picture to illustrate the sentence's meaning. Then the student writes the second sentence and I will illustrate it, and so on. In this example, I've used a sentence structure that Kevin can re-use substituting in other characters and costume ideas (this supports the expressive grammar so that there are not too many difficult things distracting from the main point of the exercise, which is "do you know the meaning of the sentence?"). Kevin likes to choose the colours used to draw the people, even when it's my turn (he also "fixes" my drawings if they don't have all of the details that he thinks they need!). The strength of a turn-taking exercise is that each person has an opportunity to follow written/verbal language directions and also to use language to give a clear direction to another person. We're learning language in an interactive and pragmatic (meaningful) way, which encourages generalization of the information to other situations and settings. And here's another important part - Kevin loves making these pictures and if you went to his house, you would see that the kitchen/dining area is well decorated with them. Because he is relaxed, happy and engaged while we are doing this activity, his mind is set for optimal learning and retention of the information. With your individual children and students, modify the activity (with favourite topics, using favourite art media, etc) so that they find the interaction fun and enjoyable. Also, make sure the language level matches your child/student - this may take some trial and error and will be instructive about what the functional level of language knowlege really is. I'll be interested to hear how it works with your student! Lots of infromation about the provided treatment.